Students should/shouldn’t have to learn a second language. All cars should/shouldn’t be painted yellow. We should/shouldn’t be allowed to chew gum in school. Our pets should/shouldn’t be allowed to come to school. We should/shouldn’t be allowed to wear hats in school. All fast food/coffee drive throughs should/shouldn’t be banned. School should/shouldn’t be shorter days without recess. We should/shouldn’t be able to sit beside our friends in class. We should/shouldn’t be able to eat in class. We should/shouldn’t have school uniforms. We should/shouldn’t have the option of doing school online. Fast food should/shouldn’t be banned. Cell phones should/shouldn’t be allowed at school. 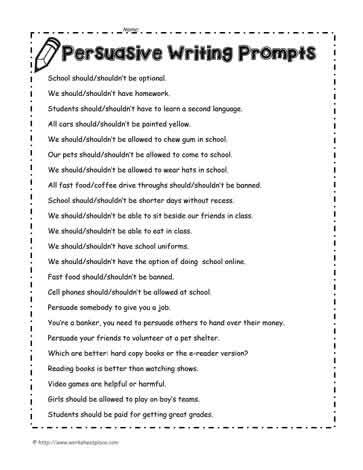 See all the persuasive writing worksheets.